But, did they really know? In this age of entitlement, it’s so easy to live in our own bubbles and forget the needs to those right in our community. After dinner that night, I wanted to not only teach my kids about serving others, I wanted to SHOW them. So where could I find an opportunity for my children to serve someone in their community? Was there such a thing as community service sign ups? I headed online and found the perfect solution: JustServe.org. Homepage of the website JustServe.org where you can find volunteer opportunities in your local community. JustServe.org is a website where the volunteer needs of organizations may be posted and volunteers may search for places to serve in the community. So basically, I put in my zip code and a long list of volunteer opportunities come up. 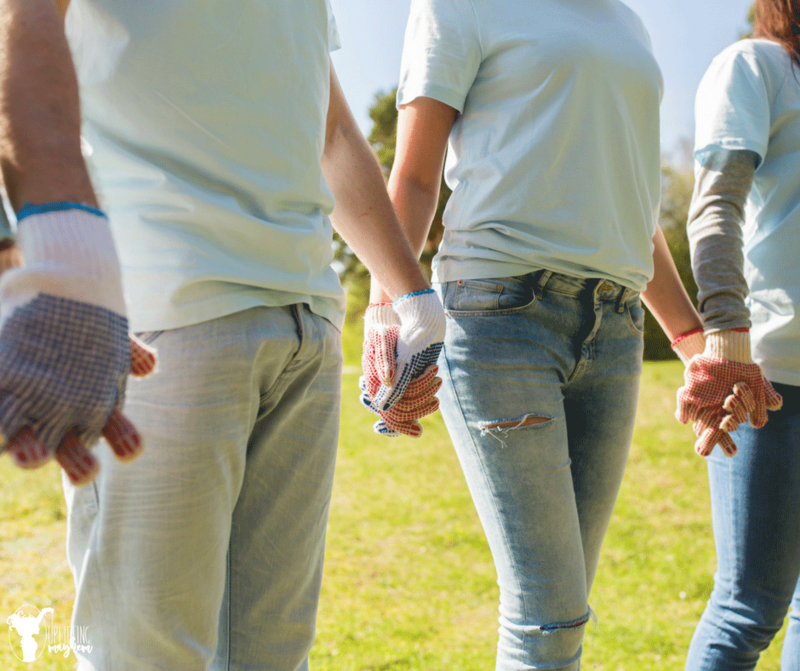 The Church of Jesus Christ of Latter-day Saints started this website, but it is not for proselytizing or publicity—it is simply a service to help link community volunteer needs with volunteers. This is exactly what I needed. The idea was simple and easy, so I started looking. When I entered my zip code, 38 volunteer opportunities came up within 5 miles of my home! After scrolling through my options, I found an opportunity to donate a meal to families in our community who were struggling with poverty. Perfect! Something my husband and I could do with our kids. So I emailed the contact person and before I knew it, we had a date and time all set. Since I am a den leader for our local cub scouts, I figured we could bring them along as well. Our cub scout group and my own kids at the local Presbyterian Church ready to feed some local families in need in our community. We came prepared to feed about 40 people a delicious spaghetti dinner. We were also invited to stay and eat with them too! The boys were instructed to wait for everyone else to eat before they could eat. We explained to them that some of these people barely have enough money, if any, for food. I think it opened their eyes a little. They were all excited to help out. Some of them voluntarily started helping serve the food and fill water glasses. One of the boys from our cub scout group helping fill water cups. The organization that allowed us to come bring dinner is called Circles Utah Valley. They have a simple community-based approach to helping individuals and families become self-reliant. I think that if I had tried to find them all by myself, it would have taken a lot longer. Thanks to JustServe.org, it was just a couple clicks away. My husband and I helping prepare a meal to serve to some families in our community. I am pretty sure my kids will still complain when I make them something for dinner that they don’t like. However, through this experience, they got a glimpse of how good it feels to help someone else. And it’s my hope that it will instill a deeper desire to help someone again. I can’t wait to try out another service opportunity on JustServe.org. Have you tried this website out before? Let us know in the comments below.